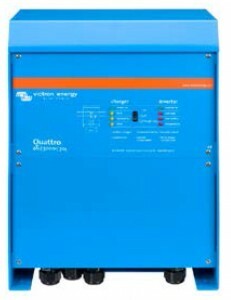 The Victron Quattro is both an Inverter and a Charger. It can be plugged in to two power sources. It will automatically detect which power source is active and run off that. It also features PowerControl which limits the amount of drawn current to charge the batteries. It also has a PowerAssist feature which compensates for any power loss. See the specifications below or contact us for a quote!